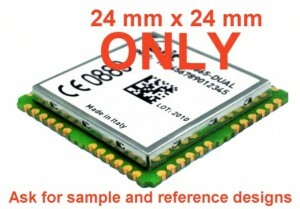 The GL865 is a tiny GSM/GPRS module (24×24 mm only). GL865 is a dual band 900/1800 GSM/GPRS module in LCC package. It offers ultra low power consumption and an extended temperature range. The small size with lowest power consumption enables the design of tiny M2M applications. By saving the board to board connectors the BOM (Bill of Material) was reduced and MTBF (Mean Time Between Failures) could rise as well. With the option for manual soldering and removal, GE865 can also serve niche applications with a low volume production. The GL865 comes with embedded Python Script Interpreter. By saving the micro controller it can save further costs and space on PCB. This helps to develop world smallest M2M applications. Right now we are thinking about a reference designs of tiny M2M applications based on GL865, because we already have access to world smallest GSM antennas and GPS antennas. This combined with SIM on Chip could save further costs and space. Just drop an email to hn (at) gsm-modem.de or use the form to get further details about GL865.